If you’re familiar with this blog, you have likely seen me discuss the importance of hand-eye coordination. As I’ve said before, there’s much more to training than strength and conditioning. You’ll be hard pressed to find many athletes who wouldn’t benefit from improved coordination. With that in mind, I’m a big believer in practicing simple activities such as juggling. In fact, I’ve already written several articles on the subject. One thing that I haven’t mentioned though is how juggling does not need to involve three or more objects. In the video that follows, you’ll see three useful variations that you can practice as a beginner. For starters, it’s worth noting that I am far from an expert juggler. I’m just a coach who believes that juggling is beneficial for his athletes. Juggling is not only useful for hand-eye coordination, but also for the brain. I recommend it to everyone. If you’ve tried to juggle before and struggled with three ball patterns, it is useful to begin with two balls. Below you’ll find three simple skills to practice. Naturally, these juggling patterns should be practiced with each hand. Don’t be surprised if your non-dominant side struggles initially. With regular practice though, you can make considerable improvements with just a few minutes each day. As far as when is the best time to train hand-eye coordination, new skills should be practiced when you are rested. For example, you could include juggling as part of your warm-up. And once you become proficient with a particular skill, it can also be useful to practice while fatigued (as discussed here). Another useful option that I’ve had success with is juggling for a few minutes at the start of each day. Doing so has proven to be a great way to get my brain firing early on. Juggling essentially forces me to be mentally sharp and aware. Even a split second lapse in concentration will cause the balls to fall. I’m sure there are some long time readers of the blog who are tired of seeing me write about hand-eye coordination. Unfortunately, it’s just one of those topics that does not receive enough attention. Thus, while it’s not my intent to continually discuss the same topic, I believe there’s still plenty of athletes who could benefit by focusing more time towards hand-eye coordination. And as I’ve said before, another benefit of these drills is that they aren’t physically demanding. 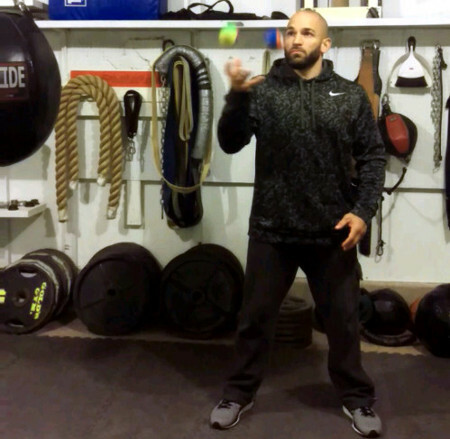 You can practice skills such as juggling every day without hindering your recovery. All that it takes is a few minutes of dedicated practice each day. Any serious athlete who can’t find time isn’t looking hard enough. Tried this 2-ball juggling. Wow, my balls were flying all over the place! Can you advise how to incrementally progress to being able to actually do this? Thanks. @John – Of the three styles that you see in the video, I’d say that the one in the middle is easiest to learn. If it’s too difficult initially, start by using a single ball. Focus on throwing the ball approximately the same height each time. You’ll also want to control your arm action (ex. don’t lift it too high when tossing each ball). As far as progressing beyond a single ball, it’s really just a case of practice. It’s natural to be frustrated at first. You can make rapid improvements with regular practice though. Hey Ross, I was just watching a video of female boxer Katie Taylor hitting the mitts with a trainer. The trainer resembled you. I’m curious, is it you in the video? Hi Peter, yes, that’s me. Congratulations on helping Katie win (in fine fashion) her professional debut! She was relentless, yet smart, in her attacks. Solid jabs, hooks to the body and head, and straight power punches. I had the pleasure of seeing her fight live a few times. Fantastic athlete. Thanks Peter, I appreciate it. I love when you write about hang eye coordination. I didn’t start doing any of this until I started reading your blog. I never get enough of hand-eye coordination. Thanks to you the first minutes of my routine are about coordination, and thinking constantly about new exercises to include. Please keep bringing up this topic…especially with youth athletes, there is a reluctance to do detail type work that will set them apart from their competition (hand-eye coordination, grip strength, recovery, mental training etc.). The art of the athlete has been replaced with exotic looking youtube videos of training methods that are difficult to execute, and don’t bring much benefit if you lack a base of athletic and physical competency. Just stopping by to say that I love your blog. So helpful!!! Hope to see your new post. Another good win for Katie. So many positive takeaways. She was sublime with her left hand. Since turning pro, and under your tutlage, she seems more tactical and less reckless when moving forward. Katie landed lots of big shots. Many of which would likely have stopped another opponent, but Obaneuf seems tough, having never been stopped as a pro. Ross been teaching me stuff since 08. Best guy ive ever seen far as s-c Goes. And im sure one of the best coaches anyone no matter what sport what level. Guy has real exp cares and approaches with a commen sense mentality catering to the health of the athlete. Something i have rarely seen in 16 years of comp. have a good christmass Ross.